If you want to get a start growing fruit in your garden you’ll need to provide the plants with the right conditions. Some plants and trees can be quite fussy, requiring certain types of soil, a sunny position or plenty of room to ‘breathe’. 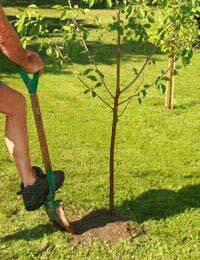 Fruit trees come as bare root plants or in a container. If you are planting them in the ground ensure the soil has good drainage, so the trees don’t get waterlogged, and dig in plenty of rich, organic matter to provide nutrients to make them grow strong and healthy. If you only have a small space, don’t worry. Many fruit trees can be grown in small areas, but you will need to prune them regularly to ensure they stay small and compact and produce high yields. If you’re training them along a trellis it’s best to start doing this when they’re young. Cut them down to knee-level to keep the growth canopy low. This will keep your fruit at an attainable height and make it easier to prune in the long term. Raspberries and blackberries are deep rooting and so need a well-cultivated free-draining soil. They prefer full sunlight but will tolerate partial shade. Make sure all weed roots are removed and incorporate plenty of rich, organic matter into the soil. Choose healthy looking canes and plant in rows 1-1.5m apart. At the end of the first year's growth new canes will shoot up. Leave these to bulk out the line a little, but take care not to let it get out of control. Raspberries in particular, are very susceptible to mildew and rot. Keep the canes well supported by stringing wire in between four wooden posts in a rectangle. This will help prevent the plants from wind damage. Plant blueberries in ericaceous compost. They do well in pots due to their fussy soil requirements and should be watered with rain only. This is because they enjoy an acid soil and can’t absorb iron from soil, which contains too much lime. Plant them in a sheltered site in full sun or partial shade. Keep unripe strawberry fruits off the ground to prevent them from rotting and snip the runners before they start to grow so the plants will concentrate their energy on growing the fruit. Taking care to ensure your fruit trees, bushes and plants get off to a good start will see them cropping each year, proving you with masses of tasty home-grown fruit. Last year my strawberries and blueberries had lots of fruit, this year none,what happened?